Kevin Saunders Hayes, a composer and songwriter, came up with the idea for Vox Lumiere nearly 15 years ago when he picked up some old silent movie DVDs in a dollar store bargain bin. The films were interesting on their own, but could they, he wondered, be made more entertaining for today’s audiences? Hayes applied his composing talents to creating rock opera-style scores and lyrics for the films and then went a step further by adding live costumed singers and dancers, as well as multimedia elements projected onto adjoining screens. Has Vox Lumiere succeeded in making silent movies more palatable to modern tastes, or has it rehabilitated the overblown staged “rock opera”? Perhaps a little of both. 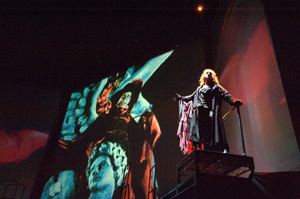 Since its debut with The Hunchback of Notre Dame in 2000, Vox Lumiere has mounted three other productions that have toured continuously in the United States, Canada and Europe: Metropolis, Peter Pan and The Phantom of the Opera — Director Rupert Julian’s 1925 film, currently playing at Los Angeles Theatre Center. The best silent films can still surprise and delight us with their creativity and strong visual emphasis, and Phantom is no exception. The horrific visage of Lon Chaney as the demented Erik still shocks, and his underground dungeon is the apex of stylish Art Deco Gothic, if there is such a thing. Incidentally, soundstage 28 on the Universal lot where Phantom was filmed is the oldest surviving movie soundstage in the world. Built to duplicate the Paris Opera and to support thousands of extras, the set was constructed with steel girders set in concrete and for that reason was never dismantled. Stage 28 still contains portions of the original set and was used as recently as 2011 for Disney’s The Muppet Movie, a delightfully absurd bookend. As the film begins, a spate of energetic dancers vault onto the stage in front of the screen as pounding rock music fills the space. It is truly a multimedia extravaganza, and you hardly know where to focus your attention. It soon becomes apparent that there are actual characters among the singers and dancers and that they are spinning a parallel storyline to what we are seeing onscreen. These outlandish creatures are the modern-day analogs to the screen characters and have the same names: the Phantom (James Lynch), Carlotta (Julie Brody), Christine (Marisa Johnson, alternating with Victoria Levy) and others. The 14-member cast is creatively costumed in steampunk style, black leather subset. The women sport tight corsets and feathered top hats, while the men’s outfits are pieced together with straps, buckles, goggles and heavy boots. Think Mad Max goes to Burning Man. The young, attractive cast sing and dance their hearts out and, with aggressive lighting techniques, provide the sense of spectacle that Hayes evidently sought to create. The songs, performed by a drummer, bassist and guitarist, are a mash-up of rock, pop, alternative, electronic dance, opera and film music. Generally, the music is pleasant and interesting to listen to (if a bit monotonous at times due to the limited instrumentation), and it is clear that a creative and experienced professional is behind it all. My main criticism would be that very often when it seemed as if a unique, compelling song was getting underway, it would soon veer from the idiosyncratic to a more familiar musical theater type of music. For me, this melodramatic kind of presentation blunted the potential impact of the songs. Nevertheless, the sound was solid and clean thanks to an excellent sound system. Vox Lumiere is to be commended for coming up with a great way to rediscover some of the best silent films, resulting in a memorable evening. Hayes is now writing for two new productions: Nosferatu, the great vampire film, and Zorro, which he hopes to do in Spanish. For those looking to experience established entertainment forms in a new and dynamic way, Vox Lumiere should be at the top of the list. Future performances of The Phantom of the Opera will be performed on Oct. 10/11, Nov. 21/22 and Dec. 12/13 at the Los Angeles Theater Center at 514 S. Spring St., LA 90013. For information and tickets: (844) VOX-ROCK or www.voxlumiere.com.